Every year my guild picks a charity and makes quilts during the year for that charity. Some of the quilts we have made and donated have been to Project Linus, the local women's shelter and community members in need of a little quilty love. This year we our charity is Victoria's Quilts Canada. They provide quilts to people in Canada who have cancer. We sorted out fabrics and put them into colour coordinated kits, which we then put into large ziploc bags. The bag I took home had some pinks and greens. It also had various size cuts with no yardage. A little bit of a challenge, just what I need right now. I scoured the internet and pinterest looking for inspiration. I wanted a simple to piece project, heck I already had a big enough challenge with the sizes. I had various 6 1/2 inch blocks, some 2 1/2 inchish strips to name a couple. 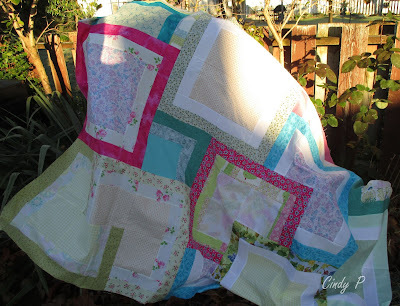 I saw a quilt called Stacked Squares Quilt at Kitchen Table Quilting. You can download the pattern from the Moda Back Shop. It uses a layer cake and jelly roll strips, but I thought I could adapt it to work with what I had. I took the 6 1/2'' squares I had and added a 2 1/2'' strip to two sides and then darker 2 1/2'' strips to the those same sides, this gave me a 10'' finished block.This size block worked out great as I ended up with a 50 1/2 x 70 1/2 inch top. The sizes that Victoria Quilts wants are adult: approximately 50” x 70”, youth: approximately 48” x 60” and child: approximately 36” x 48”. There were no whites so I used some of my own plus some additional fabrics for the squares and strips. It was an easy and quick top to piece. I think it turned out not too bad. I only hope it gives someone comfort in their journey, as battling cancer is not easy. I another picture with the sun just catching part of the top. Someone else in my guild will longarm it. My guild bought a roll of cotton batting and is also providing the flannel for the backs. I am left with the following mostly 3'' squares a few 4'' and strips ranging from 1 3/4 to 2 1/2 inches. I could use some ideas for these. How would you use them? The quilt top came together beautifully. I like how it looks layered with the layout you chose. I am a log cabin fan, so I still think that you could do some kind of log cabin variation with those left overs. What a pretty way to use what you were given Cindy! And I know you put your heart into it too. The layered squares are a really fun effect! 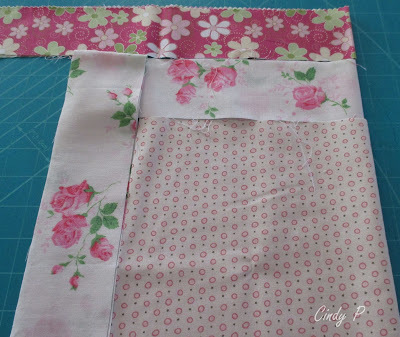 A scrappy Bento Box style quilt would be a fun way to use up those little pieces. You did an amazing job with this quilt. I love the layered squares and the cheerful colors. I agree that a wonky log cabin may be the way to go with your scraps. Lovely quilt! I know it will bring comfort to someone needing a hug. Thanks for sharing with Oh Scrap! 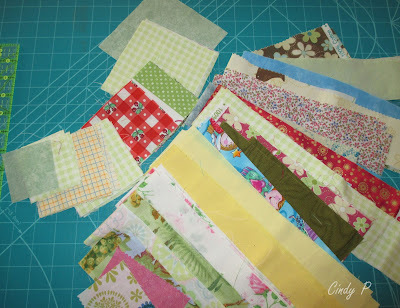 There are scrap quilt ideas on my blog in the Scrap-A-Palooza gallery. You might find something there to inspire you. I think you could do the same block but using the sizes you have and then trim the final block so all are the same. Clear as mud right, LOL I think your quilt is beautiful for a great cause. Great quilt, made and given with love 💞 Isn't it true that a guild getting together to make charity quilts actually benefits too as friendships between members deepen? 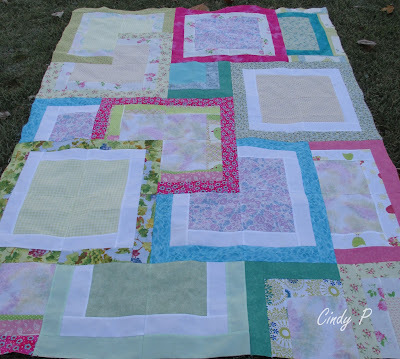 What a neat quilt Cindy! I agree with some of the other posters, a log cabin would be a great use for them.